Grab your chance to get a very special offer for such a huge, impactful bamboo plant! 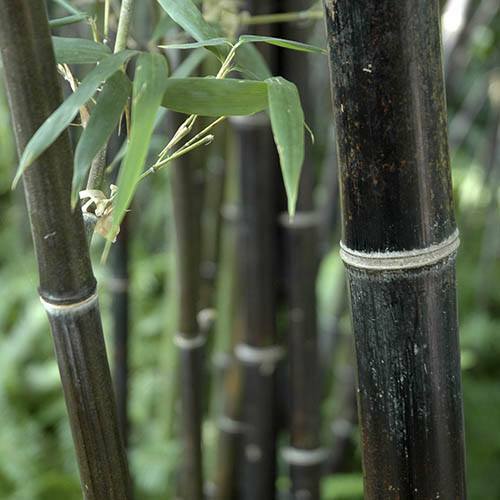 Black bamboo is slow growing, and the canes turn a rich, coffee-black colour after only a year. Theyll undoubtedly provide a wonderful spectacle and a great centrepiece. Very hardy, it needs no maintenance or pruning, so it is perfect for busy gardeners. Grab your chance to get a very special offer for such a huge, impactful bamboo plant! Black bamboo is slow growing, and the canes turn a rich, coffee-black colour after a year or so. They will provide a wonderful spectacle and a great centrepiece and talking point. This mature, well established plant will provide instant impact in a large pot (keep well watered in Summer, they are thirsty beasts), looking great on patios or decking, and requiring very little maintenace. Or plant it in the ground where it will form nice attractive clumps over many, many years. It is also good for screening or dividing areas of your garden, and will look lovely with the canes wafting and whispering in the breeze. Phyllostachys nigra is also much less invasive than others so dont worry about it taking over. Very hardy, it needs no maintenance or pruning, so it is perfect for busy gardeners, yet gives year round interest and texture to gardens of all styles and sizes. Can be divided into 2 plants in 5 years or so too! Enjoy!